One of our favorite little restaurants in Tulsa is Lucky’s. Lucky’s has the best cocktails and some of the most delicious appetizers. In fact, I can count on one hand the number of times we have actually had a full dinner at Lucky’s . Mostly, we sit at the bar, watch handcrafted cocktails being made and order the Grilled Flat Bread w/Crispy Sage, Figs, Goat Cheese and Pear, Drizzled with White Truffle Oil. Not Ketchup is a sponsor and provided me with my choice of flavor. I had this flat bread in mind from my first taste of the Spiced Fig variety. First, you have to make the flat bread. Combine water and yeast and stir to dissolve yeast. In a bowl of a stand mixer, add yeast mixture, olive oil, salt and 1 cup of flour. Using the dough hook to mix, knead until the dough is smooth and elastic. Add up to 1 cup more flour if needed. Place dough in an oiled bowl and let rise until doubled. Roll out thin and prick dough with a fork before grilling. As the bread rises, assemble your other ingredients for the toppings. Preheat grill to 400 F. (or gas grill on medium high). Brush grill with olive oil. Place flat bread dough on the grill. (Make sure that you have pricked the dough so air bubbles don’t form.) Place on grill for 1-2 minutes or until grill marks form and it is easy to flip. Oil the top side of the bread before flipping. Flip and quickly spread on the Ketchup Spiced Fig dipping sauce, arrange pears, and sprinkle on feta. Sprinkle with fresh ground pepper if desired. Close grill lid. Cook for another 1-2 minutes or until cheese softens. 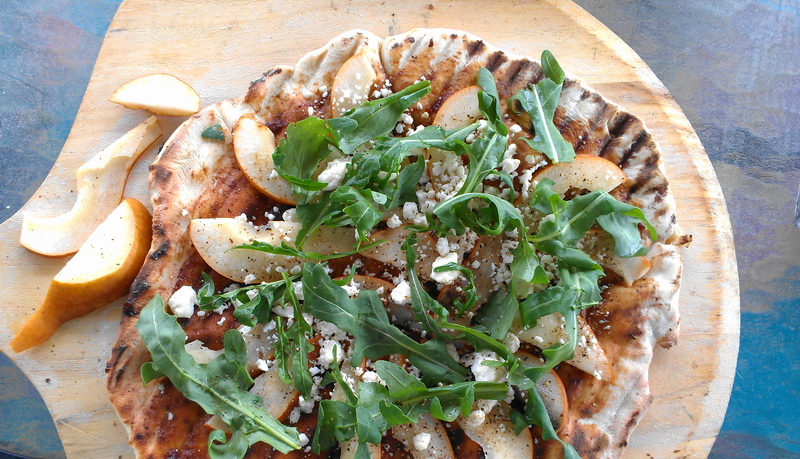 Remove and garnish with arugula. So, this recipe was good; in fact, it was delicious. To qualify though, it isn’t like Lucky’s. We were definitely missing the truffle oil. That’s okay, though. It will keep us coming back to experience the real thing. We do have a new favorite recipe for summer grilling and #HotSummerEats though! 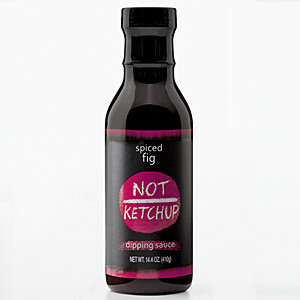 To win some Not Ketchup goodness and many other prizes, please enter THE GIVEAWAY. Click here to enter (from my previous post). You won’t believe all the cool freebies! Disclaimer – Thank you to #HotSummerEats sponsors BenBella Vegan, Caribeque, Casabella, Gourmet Garden, Intensity Academy, Not Ketchup, Out of the Weeds. Pirate Jonny’s, Quirk Books, Spicely Organics, T.Lish , and Voodoo Cheffor providing the prizes free of charge. These companies also provided the bloggers with samples and product to use for#HotSummerEats without additional compensation.All opinions are my own. Stay tuned for more summer-inspired recipes. A fantastic meal. And how cool that you even made your own flatbread. Thanks, Angie. This is be that we will definitely be making again. Love everything about this post, the brand name of the condiment, the flatbread and the board you serve it on. Thanks, Lea Ann. It’s just a pizza peel (that came in pretty handy with flipping it on the grill). These flavor combinations sound amazing!! Thanks, Danielle. Hope you try it out. We have a Lucky’s here in Michigan too that we love…..I also love the flavor combo that you used for this delicious looking flat bread. what a great dish! i love flat breads but never make them at home. i love this idea! Hope you try out the flatbread soon. Thanks, Sarah. What a GREAT recipe! I have never grilled dough. I think I must! 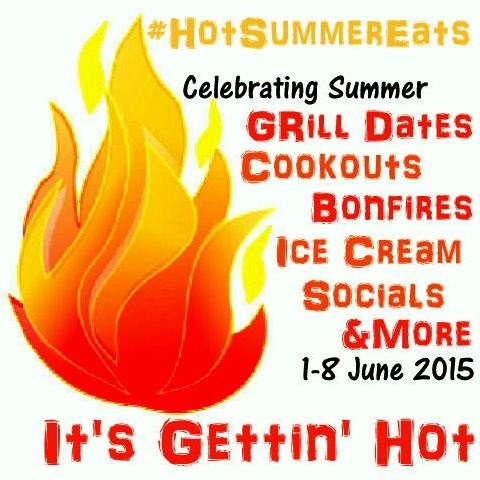 Thanks for sharing with #HotSummerEats. So glad you joined us. You must! I highly recommend it! Thank YOU for hosting! You’re invited anytime. The patio is now open. WOW this looks delicious! 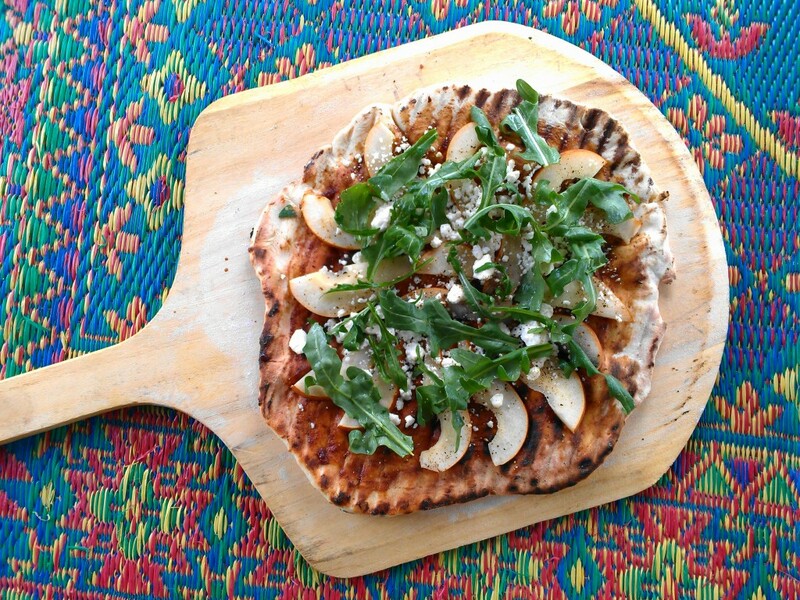 I’m so glad you enjoyed your Spiced Fig Not Ketchup – I am putting this flatbread on my “Must Make” list immediately! Thanks so much for stopping by, Erika. And, THANK YOU for the most awesome product. I thought the blueberry and cherry were delicious and couldn’t imagine topping them. The fig, however, is my new favorite! Love it! I love grilled breads and using the spiced Fig as the sauce was genius! Thanks, Amy. I can’t wait to experiment further with this sauce. 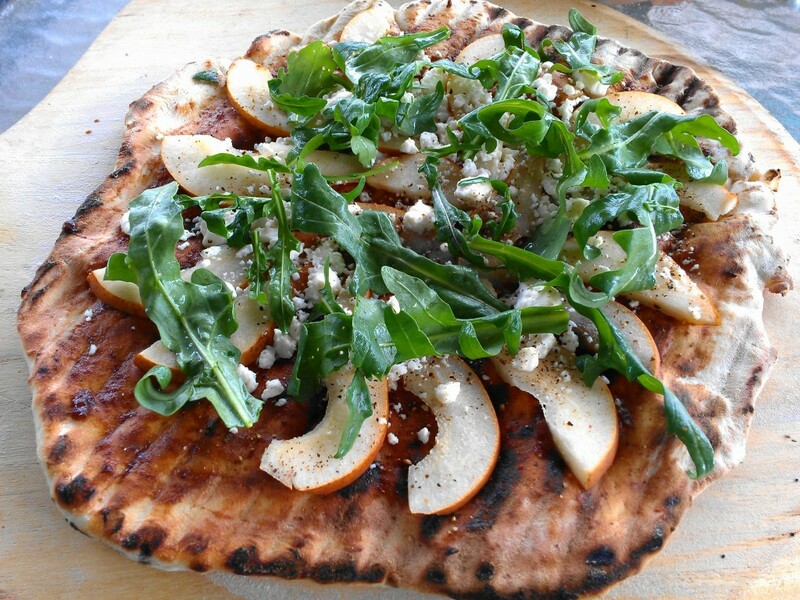 What is it about pear that makes it so perfect with salty cheese and peppery arugula? Great combo here!! The original dish at Lucky’s has fried sage on top (which is delicious) but I wanted this to be a bit more spring-like. You are so right about pears and a good salty cheese. That’s exactly where we ate it! I am definitely a feta person. I love this! I’m using feta a lot this summer. It will be featured in a few more recipes for #HotSummerEats. Oh my gosh I love that you used the spiced fig sauce as the sauce on the flatbread! I got the smokey date and may need to try a variation using that. Great recipe! Do that! I think that would be great!!!!! That dipping sauce sounds very interesting and that flatbread looks awesome! So pretty! I love all the flavors you’ve got here.